Tall buildings adorn the backdrop in the downtown region of the City of Regina, Saskatchewan where people wander up and down Scarth Street browsing at the stalls during the Saturday markets. Every Saturday, the stalls are open from May until October bringing out thousands of people looking for unique gifts, souvenirs, fresh fruits, produce, meats, cheeses or baked items. As winter approaches, the markets take on a new look and it becomes the winter market where Christmas ideas are found at many of the stalls. This market is open until a week before Christmas and then the street remains quieter on a Saturday until the stalls are opened again in May. Market stalls during the Saturday markets in the City of Regina, Saskatchewan, Canada. 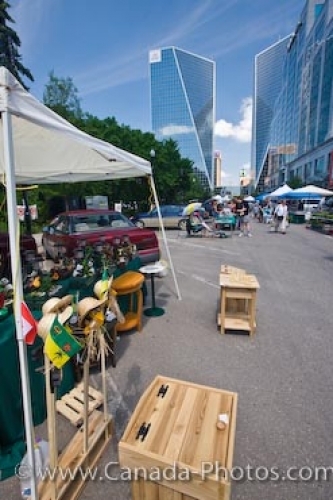 Picture of the street in Regina City, Saskatchewan where stalls are set up at the Saturday markets.